As Ljubljana is fairly small, it’s super easy to walk around and it helps that it’s connected by a series of historic bridges in the middle! Well known for being home to no less than SEVENTEEN bridges, the Slovenian capital is a visual treat and it’s bridges add to its interesting history. My favourite ones were the iconic Triple Bridge, Dragon Bridge and Butchers Bridge too. Dating back to the 1800s and at the heart of Preseren Square – the focal point of the city – the Triple Bridge is the city’s most famous and most visited too. I also loved the Dragon bridge which was built in 1901 with yep, you guessed it, huge green dragon statues at the end of each walkway. The Butchers Bridge is lined with glass walkways giving a view of the Ljubljanica river below, and the support cables either side are decorated with ‘lovelocks’ left by tourists and locals alike. I walked along these bridges many times during my stay to get from one end of the city to the other as they connect the old town with the new town and I found it to be a great way to get my bearings and explore the area! Ljubljana is a modern, up and coming city with cool bars, nice restaurants and plenty of green spaces in between. If, like me, you love nothing more than wandering around for hours and exploring a new city on foot, you will fall in love with Ljubljana. During the summer months I imagine the streets will be packed with tourists, but during my visit in September it was fairly quiet and we pottered about quite happily. Much like the bridges, the Ljubljanica river is at the heart of the city and its’ one of the most well known features. The city comes alive at night, and the numerous bars, cafe’s and restaurants that are dotted along the riverbanks make it a vibrant place to be no matter what time of year you’re visiting. One of my favourite things to do when exploring a new city is climb a tower, or find a castle, or do BOTH! Luckily in Ljubljana I was able to do just that and discovered the medieval fortress that has been present since the 11th century. The castle was thought to have been constructed in the 15th century, and it’s prominent position on top of a hill enables it to take in some spectacular views over downtown Ljubljana below. After a short walk from the central Preseren Square, Toni and I took the funicular up to the top of the castle fortress where we were treated to stunning views over the city below just as the sun was starting to set. Exploring the castle grounds at dusk was a magical experience, as was catching the last of the sun’s rays as the red roofs shone in a bright orange glow on our first afternoon in Slovenia… Truly mesmerizing! Despite only having two nights to cram everything in, we knew that no visit to Ljubljana would be complete without a day trip to the most talked about lake in the world right now… the stunning Lake Bled! The wanderlust inducing images that I’ve seen all over social media made me want to visit this place months ago, and I’m soo glad we were able to squeeze in a visit during our time in Slovenia. The wonderful guys at Roundabout Travel booked me on to their full day Alpine Fairytale Tour which sounds as magical as the name suggests. One of the highlights was of course the magnificent Lake Bled which looked incredible against a backdrop of blue sky and yellow sunshine as we enjoyed a warm sunny day in September. Bled was everything I thought it would be and a little trip across to the island on a traditional Pletna made for the most photogenic boat ride I have ever taken. Despite its beauty, Bled was absolutely HEAVING with tourists and their annoying selfie sticks, especially at the cafe at the top of the hill which gave us some breathtaking panoramic views of the lake below. We did however enjoy an ice cream with our view before climbing up to the castle and seeing yet more spectacular scenery. I can see why it’s so popular – it took my breath away every time I looked at it and looked picture perfect from every single angle! On our Apline Fairytale Tour we spent a full nine hours exploring different parts of Slovenia that you can’t see whilst in Ljubljana alone, and the tour really gave us a chance to see other important areas of the country. There was only six of us, and our tour of the Julian Alps began with a visit to the traditional medieval town of Skofja Loka, elevated 1000ft high and built in between two rivers, where we walked along its cobbled streets and stumbled across its ancient town square. Next up was a stop at Triglav National Park, with its resident glacial lake and mountainous backdrop. I’m gonna be a little controversial here and say that I actually thought this place, Lake Bohinj, was EVEN BETTER than Lake Bled because the mountains surrounding the lake were insane and there was literally no one around and it was so peaceful and beautiful and I just loved it so much. Isn’t it amazing what you can discover when you steer away from the tourist hot-spots and find hidden gems like this?! Our tour guide was amazing – super knowledgeable and really friendly whilst allowing us plenty of free time to explore at our own pace too – thank you Jerry for looking after us during our time in Slovenia! As if you needed any more reasons to visit Slovenia than your very own WATERFALL! I had never heard of Vintgar Gorge until I booked on to the Alpine Fairytale Tour and it definitely ended up being one of the highlights of our entire trip, not just on our visit to Slovenia. Walking through the Gorge, with it’s caves, bridges, narrow walkways and glorious waterfalls was a truly amazing experience and one I definitely won’t forget in a hurry. You can walk at your own pace whilst following the trail, stopping to take in the scenery and to take a million photos like I did. The walk takes around an hour to complete and isn’t too difficult, just a little hilly and narrow in places but there are plenty of people about and a cafe/shop/toilets at the end for you to make use of. I got the most stunning photos of this place and every now and then I have to pinch myself and remember that I ACTUALLY went there because it was just so beautiful. If you get the chance to visit this place whilst in Ljubljana, please please go – I promise you’ll love it just as much as I did! 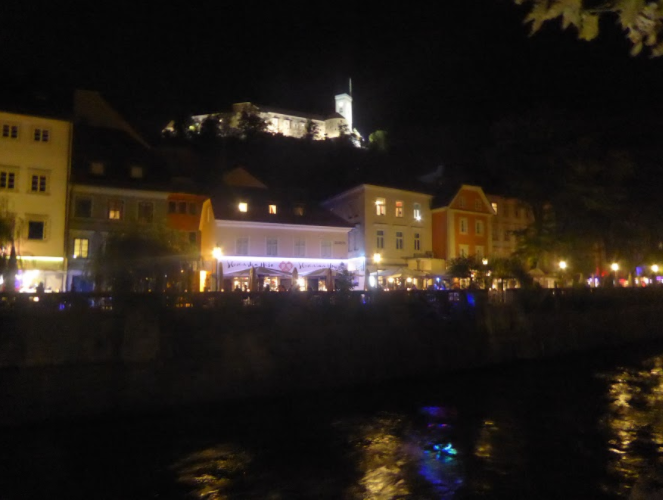 Ljubljana is brimming with trendy bars, cafe’s and restaurants to choose from during your stay and we were certainly spolit for choice when it came to finding some yummy food after a busy day of exploring. After crossing the Dragon Bridge you’ll walk alongside the Ljubljanica river and find numerous places to choose from. There are restaurants from all corners of Europe, most notably Austria and Italy where Slovenia takes lots of food influence from, and we ate in a fancy Italian restaurant one night which was AMAZING. We also found a cute cafe which served traditional Slovenian cakes including apple pie, derived from Balkan influences and one of the most popular dishes in the country. Whatever your tastebuds desire, you’ll be spoilt for choice in Ljubljana. As my friend and I were inter-railing for ten days we were on a budget and most of our accommodation consisted of hostels/cheap hotels. We were a little limited for choice in Ljubljana as we left it late to secure anywhere and we found there was a huge conference event taking place during the weekend we were there which meant that lots of hotels were already booked up months in advance. I did however manage to find a little gem just a stones throw away from the centre of the city which meant we could enjoy all the sights with the comfort of knowing that everything was within walking distance. 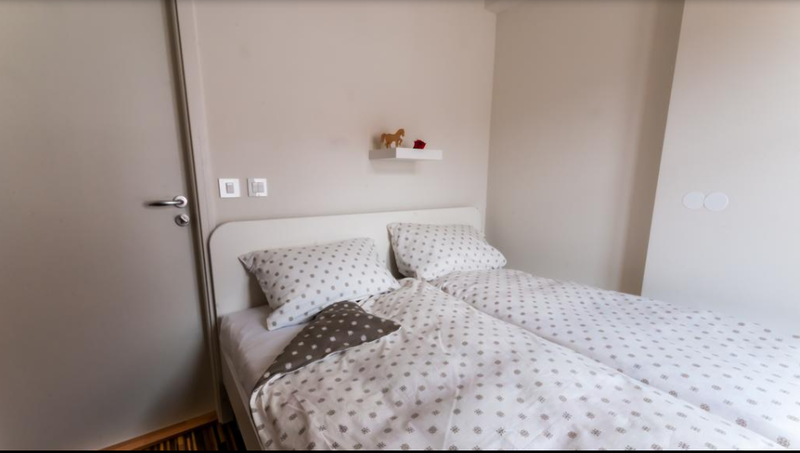 Cube Central Rooms For 2 provided exactly as the title suggests – compact rooms for two in an unbeatable central location. This place was neither hostel nor hotel, more like tiny little self catering apartments with shared common rooms and bathrooms. Perfectly formed, despite being super small, and with key codes instead of physical keys, our double room barely had any space for ourselves let alone our suitcases and hoards of clothes, but it was cute and the beds were comfy which is all we really needed. I think the rooms were all full during our stay, but we rarely bumped into any other guests at all and pretty much had bathroom use whenever we wanted it – no queues for the toilet in the middle of the night! If you’re looking for luxury, this isn’t the place for you, but if you just want somewhere to rest your head for the night and enjoy a peaceful residential location just away from the city centre, I would definitely recommend Cube Central Rooms For 2! Thank you to Petra the lovely receptionist for making our short stay so comfortable! As you can see, I managed to fit an awful lot in to my short time in Ljubljana, but I am sure there are many things that I missed and did not get chance to include. If, like me, you’re limited on time I would suggest that these sights are a good place to start. Ljubljana is so pretty and so full of greenery it would be nice to just find a park on a sunny day and enjoy the scenery, but equally it’s great fun for a jam-packed city break and the area has so much to offer. Have you ever been to Ljubljana before, or is it on your bucket list for 2018? Let me know as I would love to hear your thoughts! NB. My stay at Cube Central and my tour with Roundabout Travel were offered to me at a discounted rate for the purpose of this blog post, but all thoughts, images and notes are of course my own.